50 NEW HANDMADE FLOWERS CROCHET IN MULTICOLOURED SIZE 3 CM X 1.5"
50 x New handmade crochet flowers in Multicoloured. 3 cm wide x 1.5". 5 handmade crochet flowers. If not needed, simply snip carefully off! 5 X HAND CROCHETED APPLIQUE FLOWERS ,LILAC , 4.5 CM , DOUBLE KNIT. 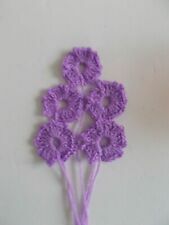 5 X HAND CROCHETED APPLIQUE LILAC FLOWERS, 4.5 CM IN DOUBLE KNIT. 3 ps Pretty handmade crochet flower. Looks great like cloths decoration or table decoration and many other. Crochet from mercerised cotton. 30 handmade crochet flowers in autumn colours 6 different colours, 5 flowers of each colour. 30 Handmade crochet flowers in cream, yellow, pink colour. 100% acrylic. 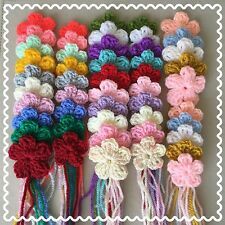 10 handmade crochet flowers in rafia. 34 New handmade crochet flowers in white. 1.5” and 3 cm. If not needed, simply snip carefully off! 30 handmade crochet flowers. – especially my other crochet flower & leaves. Handmade beautiful crochet flowers will make a lovely addition to crafts, cards, clothes (especially babies and children's), scarves, hats, shoes, slippers, cushions, hair accessories etc. A lovely set of five stitch markers, Flowers. If not needed, simply snip carefully off. Beautiful handmade crochet bluebell flower with leaf. With long tails for easy sewing. Condition is New. Hand Made crochet sheep Appliqué, with a little yellow flower by her ear. UK 9X DAISY PATTERN MAKER FLOWER KNITTING LOOM WOOL YARN NEEDLE CROCHET CRAFT Features: Ideal for knitting the beautiful flowers and patterns. A great easy, funny, fantastic useful tool set for you. 6 different sizes, 9 pieces, one base, one central axis, one needle, one hexagonal frame. three round frames, two square frames. Made of ABS resin and POM resin, lightweight but strong and durable. Specification: Material: ABS resin and POM resin Size length of base: 4"/ 10.16cm Central axis: 1.2" x 1.1"/3.05 x 2.79cm (D*H) Hexagonal frame diameter: 2.8"/ 7.11cm Two square frames: 3.4"/ 8.64cm (L), 1.8"/ 4.57cm (S) Three round frames diameter: 3.4"/ 8.64cm (L), 2.4"/ 6.10cm (M), 1.9"/ 4.83cm (S) Needle length: 2.8"/ 7.11cm Package included: 9pcs/set x Flower Loom Note: Due to the difference b. 30 crochet flowers in white colour. 100% acrylic. 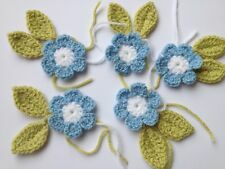 Handmade beautiful crochet flowers will make a lovely addition to crafts, cards, clothes (especially babies and children's), scarves, hats, shoes, slippers, cushions, hair accessories etc. Quality premier acrylic wool, can be machine washed and tumbled on a low heat.